What Is a VPN? How Do They Work? Setting Up Our Own. To watch the youtube video where I explain this topic, please click here. 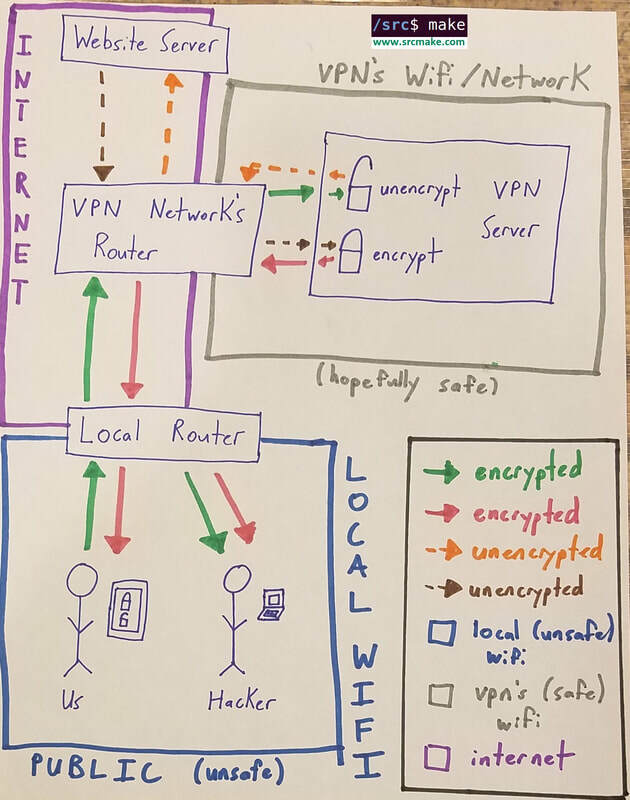 A VPN (Virtual Private Network) is a method for making an encrypted connection to a computer/server on another network over the internet, and sending all (or most) internet traffic to go through that connection. For example, if we're on our phone at a coffee shop and we're using their wifi, it's possible that everything we do online (visiting websites, logging in to an account, making posts etc.) can be intercepted by hackers (or whoever is providing the internet). Think about it, everything we do is passing through someone else's wifi/router, as seen on the picture to the right. If the website/app we're using doesn't have SSL implemented, then anyone looking at the data packets can see plain-text information about what we post. That means they can see our username and password for the websites we visit. That's bad. 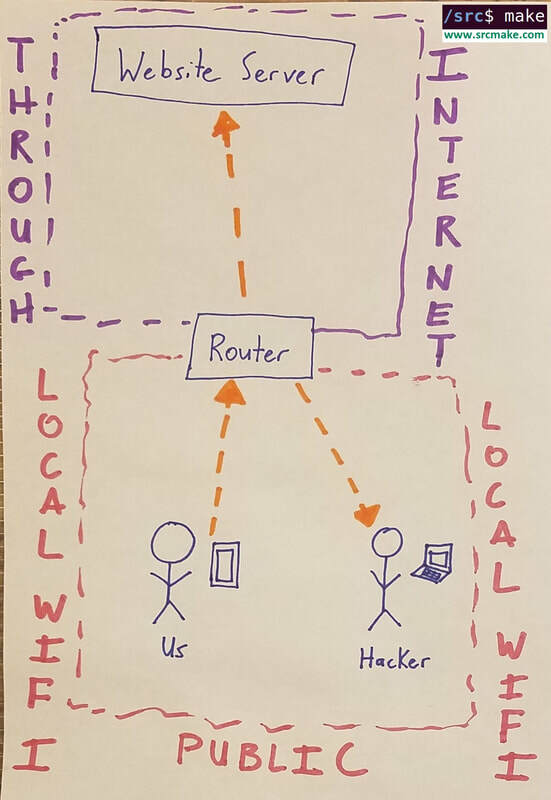 When on public wifi, anything we send to the internet could also be seen by a local hacker. The theory behind the VPN also comes with some additional benefits. Let's look at the reasons to use a VPN. 1. Security - If you're away from home and on someone else's wifi, then the websites you visit and anything you do (ex. login, post information) can be intercepted by a hacker or by the network owner. If you use a VPN, then all the information on your device is encrypted, meaning that anyone who intercepts the data won't be able to do anything useful with it. You're at home and want to access files from your work network. There are region/local locks for something you're accessing, and a VPN would let you bypass it. For example, a country block for viewing a youtube video. Or perhaps the network you're on blocks a certain website or activity (such as in school or at work). Using a VPN can bypass this. Personally, I pay for cable and internet as a package at my house. Sometimes when I'm away from home, I'd like to use my Cable/ISP's app/website to stream a TV show or sports game so that I can watch it on my phone/laptop/whatever. The problem is, the app usually only allows you full access if you're at home on the home network. (They know.) Using a VPN tricks the app into thinking that I'm on my home network, and will give me full access to my cable provider's apps. Those are the main reasons for using a VPN. . We'll be focusing on reasons (1) and (2) as the motivation behind creating our own VPN. How Can We Make Our Own VPN Server? Actually set up a computer/laptop/Raspberry Pi/cloud server/whatever with the proper configuration to accept incoming traffic. There's a simple way to do this for Windows, and a Super Hard (but proer) way to do this for Linux. Don't be scared, I'll walk through everything necessary. This is a topic in itself, and so I've moved this section to be a separate blog post. Click here to set up your own VPN server on Windows 10. To be honest, the method of creating your own VPN Server using Linux isn't for the faint of heart. However, I've made it as simple as possible by giving only the necessary commands. We looked over what a VPN is and how it works, as well as the benefits that come with using them. If you feel that there's some aspect of using a VPN that you'd like to have available to you, then you can create your own. ​I personally find it great to set them up at your own house (or at a relative's house), but if you want to set it up on a cloud service like Digital Ocean, then try to find a service you trust.